Nagasaki (長崎) is the capital of Nagasaki prefecture on the island of Kyushu, Japan. 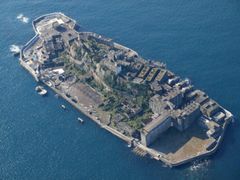 Under the national isolation policy of the Tokugawa shogunate, Nagasaki harbor was the only harbor to which entry of foreign ships was permitted. Even today, Nagasaki shows the influence of many cultures such as Dutch, Portuguese, and Chinese. Further evidence of this is a robust Christian community in Nagasaki; the seasoned Japan traveler will be surprised by the plethora of churches in this unusually pious city. On 9 August 1945, three days after the bombing of Hiroshima, a nuclear bomb was dropped on Nagasaki, killing a total of over 100,000 people. While visitors to Nagasaki should be mindful and respectful of terrible events of the war, they should also be aware that most Nagasaki natives don't even think twice about the bombing in their day to day lives. Visitors familiar with Hiroshima's expansive Peace Park will be surprised that memorials to Nagasaki's atomic tragedy are much smaller, understated, and dispersed throughout the town. While Hiroshima utterly transformed itself in the wake of the A-bomb, Nagasaki has gone the opposite route and reclaimed its pre-war identity as a culturally and religiously diverse port town, with a dash of Showa-era charm that your average ferro-concrete Japanese city could never hope to copy. Nagasaki features the typical humid subtropical climate of Kyushu and it's the third rainiest city in Japan, (behind Shizuoka and Kanazawa). Winters are damp and moderately rainy (much like the rest of the country) and temperature readings usually range from 3°C to 10°C (38°F to 50°F), therefore one should bring some winter clothing especially for the night. Light frosts and sleet are possible (the average sleet/snowfall is 4cm (1.6 inches)), but heavy snowfalls are very rare. Recently, in January 24th 2016, Nagasaki picked up 17cm (6.7 inches) when a record breaking snowstorm struck southern Japan. The lowest recorded temperature is -5.2°C (22.6°F). Summers are milder than most of Kyushu with afternoon highs topping 32°C (90°F). Keep in mind that 628mm or 24 inches (! ), fall from the beginning of June until the end of July, mostly as downpours, which in return leaves some room for the sun to come out for a few hours. Towards the end of the summer and beginning of autumn Nagasaki often gets affected by hurricanes, but very seldom cause extensive damage. Like cold waves, heat waves are rare as temperatures have never reached 38°C (100°F). Overall, it is generally agreed that the best time to visit the city is spring or the end of autumn, because the weather is good and the city looks lovely during the cherry tree blossoming and the autumn foliage. Nagasaki has a small airport about an hour north of the city on an island in Omura bay, served by both of Japan's major air carriers. JAL and ANA offer nonstop flights from Haneda Airport in Tokyo and Osaka's Itami Airport. ANA also offers nonstops to Nagasaki from the Nagoya Centrair Airport and Naha Airport in Okinawa. In 2005, a new low-cost carrier, SNA (Skynet Asia Airways), began flights from Tokyo's Haneda Airport, providing cheaper tickets than major carriers. Starting in 2012, discount airline Peach offers flights to Kansai Airport in Osaka (KIX). There are also nonstop international flights to Nagasaki from Shanghai (China Eastern Airlines) and Seoul (Korean Air), but these run much less frequently than the domestic flights. Buses connect the airport to the Nagasaki train station and onward to Cocowalk mall (1 hour, ¥900). In practice, Fukuoka serves as a useful secondary airport option, reachable by highway bus for ¥2,500 in just over two hours (stopping only at the international terminal; a free airport shuttle circles around to the domestic.) Fukuoka offers access to many more international flights, as well as JetStar and Air Asia discount flights to Tokyo. The fastest and cheapest route between Nagasaki and Tokyo is the combination of highway bus and discount flight in Fukuoka. JR Kyushu runs the Kamome (かもめ) Limited Express train service from Hakata station in Fukuoka once or twice every hour. The one-way ride takes about two hours and costs ¥4,910, although it's recommended to buy nimai-kippu (discount two tickets) for ¥6,180 or yonmai-kippu (discount four tickets: recommended if two people travel) for ¥10,280 (5,140 yen for round-trip per person). Kamome tickets are also much cheaper (actually economical compared to the highway bus) if purchased as an extension of a Shinkansen trip into Hakata from the north-west. TIP: If you intend to travel on the Kamome line from anywhere North of Nagasaki try to reserve a window seat on the left side of the train car on your way down to Nagasaki and on the right side on a trip departing from the city. This will ensure that you that get a close-up view of the fantastic scenery as the train runs right next to the Ariake Sea coast line. Connections to the Kamome can be made from the rest of the country via the Shinkansen (Hiroshima, 3 hrs; Okayama, 4 hrs; Osaka, 4 1/2 hrs; Tokyo, 7 hrs). From Kagoshima-Chuo station in Kagoshima, Nagasaki can be reached via the Kyushu Shinkansen and Kamome in about 3 3/4 hours. You can travel overnight from Tokyo to Nagasaki, however you will have to take three trains: the 10 PM Sunrise Seto/Sunrise Izumo overnight service to Okayama, the Shinkansen from Okayama to Hakata, and the Kamome from Hakata to Nagasaki. This will take a total of 13 hours, and if you're willing to constantly change trains, you will be rewarded as your journey will double as lodging. Japan Rail Pass holders must pay the lodging charge on the Tokyo-Okayama segment; the rest of the trip is covered under the pass. Lodging charges currently range from ¥9450 for a B solo to ¥10500 for a B single, to ¥16500 for an A single deluxe. If you really want to travel on the cheap side, ¥3660 gets you your own floor space... literally, you sleep on the floor. Highway buses from Hakata station and the Fukuoka airport international terminal are the most economical way to reach Nagasaki from Fukuoka, costing about ¥2,500 each way and taking about 2.5 hours. In Nagasaki, the buses arrive and depart from a small bus station across the road from the main train station. They depart about every 15 minutes during the day, though not all stop at the airport. The Holland overnight bus runs from Kyoto and Osaka Umeda to Nagasaki (11 1/2 hours from Kyoto, ¥11300; 10 hours from Osaka, ¥11000). An additional bus, the Roman Nagasaki, runs from Osaka Hankyu Bus Terminal to Nagasaki at the same cost and time. The Princess Road and Etranger overnight buses run from Kobe Sannomiya (10 hours, ¥10500) and Himeji (9 hours, ¥9580). Trams (路面電車 romen densha or チンチン電車 "chin-chin densha") connect most of Nagasaki; they run about every ten to fifteen minutes during the day. The most frequently used lines will be the red (3) and blue (1); the blue and red lines run on the same track from the northern end of Nagasaki as far as the Nagasaki train station, where they split. The blue line continues to the You-me Plaza shopping mall, and later the downtown shopping arcade. A one-way trip is ¥120 and you can get a transfer ticket (乗り継ぎ券 ”noritsugi ken") to continue your trip, if it requires two streetcars. These tickets can only be acquired if you get off at the Tsuki Machi stop. You can save money if you're doing a lot of travel by purchasing a daily pass for the streetcars (¥500) which you can purchase at most major hotels. 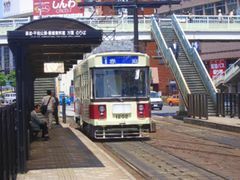 Buses also run through much of Nagasaki, including places that aren't served by the streetcars. It should be mentioned that the street cars stop running around 11PM, and most bus service also has downtime at night. This can come as a rude awakening if you go out in Shianbashi, only to find that you have to stay until 6AM for the first running densha. For the adventurous, it takes about an hour to walk from Shianbashi to Sumiyoshi. This timeframe is heavily dependent on how fast you walk, and what kind of night out you experienced. Lantern Festival・・・Lunar New Year (mid Jan-mid Feb). Held by Nagasaki's Chinese community, large lanterns are displayed on street corners and in the shopping arcades. Venture through Chinatown or along the river in the evening to see some of the 20,000+ lanterns displayed in the city. 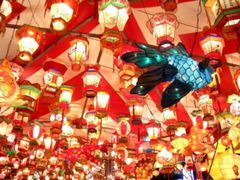 Many of the lanterns are shaped like animals or figures from Chinese mythology, and the major lantern every year represents the corresponding zodiac animal (eg, 2008 featured rats, 2007 featured pigs, etc). O-Kunchi・・・the city's biggest and one of Japan's more popular festivals, taking place in early October. This festival, based around the descent of the city's patron kami（神）from their home high up in the Suwa Shrine, features choreographed routines with giant, cumbersome floats, sake, and a general feeling of celebration. Finding food will not be a problem during O-Kunchi, as the streets are lined with thousands of vendors hawking takoyaki, yakitori, and grilled corn on the cob. Although all of Japan celebrates O-Bon in August, Nagasaki puts a unique and deafening spin on the day of ancestor worship. Head down to the harbor for the main festivities, which involve far more alcohol and fireworks than is generally considered safe. A quick boat ride to Iojima is the easiest way to get to a beach. From Nagasaki harbour to Iojima is about 1500 yen and about 10-15 minute another 500 yen gets you in. The boat ticket allows a visit to the hot springs in the hotel on Iojima so that visitors can wash up. A quick jaunt into Shianbashi, or Shianbash for short, is a must when you visit Nagasaki. This area of Nagasaki exudes debauchery, full of numerous Snacks (not to be confused with a snack bar) and drinking establishments. If you happen to be in Nagasaki between March and June, might I suggest that you take a walk with Saruku-Chan. More commonly known as Saruku-Haku, these guided tours allow the Sarukist to experience the history of Nagasaki in a very unique way, by walking it! Available with orators teaching in either Japanese and English, these walks are quite the learning experience. These walks require a bit of multitasking, one must be able to listen, walk and look at the same time. The course sizes range from just a few miles to a monstrous 13 mile jaunt. Youme Saito - Located next to Dejima Wharf in downtown Nagasaki, this multistory shopping plaza offers a range of stores and services, including a Starbucks, travel agent, a grocery store in the basement, and of course, a grand selection of clothing stores. The grocery store in particular has a good selection of foreign imports and cheese compared to other supermarkets. The Kinokuniya bookstore on the fourth floor carries a small selection of English-language books. Next to Kinokuniya is also a food court with multiple selections. Youme Saito is easily accessed by taking the blue streetcar line to the Ohato stop. Nishi-Hamanomachi - Also from the blue line, you can access this enormous covered arcade from up to four streetcar stops, the easiest of which are the ones marked "Hamanomachi." There is a proliferation of restaurants, coffee shops, clothing stores, hair salons, and multi-level electronics stores. Chitosepia - At the Chitose-machi tram stop, with several clothes stores on the second and first floor as well as an arcade on the second floor. This can be a good place to start shopping. Several restaurants are in the basement as well as a grocery store. The restaurants include Japanese food, a curry restaurant and an Italian restaurant. One recommendation for a cheap and tasty pick-me-up snack is the Hearth Brown patisserie on the lower level Also one of the restaurants here serves Turkish rice (toruko-raisu). Seiyu - Beyond the reach of the Nagasaki trams, so take a bus, is the shopping center of Seiyu. With a Haagen-Dazs ice cream shop and a McDonald's in front it is hard to miss. With almost anything anyone could want, from book store to clothing stores to electronic stores, Seiyu has it all, though in a slightly inconvenient place. AMU Plaza - At the Nagasaki station tram stop is Amyu (AMU) Plaza and with a multitude of stores to see in the plaza and several stores around the plaza that might interest people, including a book shop and an arcade. The bookstore contains a small but serviceable selection of English-language books as well. Inside the plaza is 3 stories of shopping extravaganza, there are clothes, books and electronic stores all around. There are several restaurants on the bottom and top floors of the building as well as an area for people to buy Nagasaki related knick-knacks and souvenirs. There is also an import store called Dragon Deli on the bottom floor where one can find soda that isn't readily available in the rest of Nagasaki, like Dr. Pepper and A&W Cream Soda. Amu Plaza is more expensive than YouMe Saito. CocoWalk - The newest of the "malls" in Nagasaki, CocoWalk has a range of stores mostly aimed at the younger crowd. There is a Starbucks, sports club, book store, pet store, phone shops, Toho Cinema, bar with outside sitting area, supermarket (Red Cabbage) and around 10 restaurants including an international buffet and Thai. It certainly feels like the most modern of the shopping areas in Nagasaki. The bus station is under the building, where you can get a bus to Nagasaki Airport. 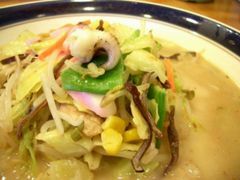 Nagasaki's most famous dish is champon (ちゃんぽん), which is a hearty dish of noodles in a pork-based broth, filled with vegetables, bacon, shrimp, squid, and scallops. Saraudon (皿うどん) is another popular dish that combines the meat, seafood, vegetables, and sauce of champon, but serves it on a plate, or 'sara', over crispy dry fried noodles. For Nagasaki's most well-known champon and saraudon restaurants, it is best to head into Chinatown (blue streetcar to the Tsuki-machi stop). While you're there, try out some of the fantastic street food, such as kakuni-manju (marinated braised pork cutlet served in a steamed bun), ebichiriman (shrimp fried in chili sauce, again served in a steamed bun), and marakao (steamed pound cake, usually available in chocolate and chestnut flavors). Castella (カステラ) is a sponge cake that was originally brought by the Portuguese; it has assumed a distinctly light Japanese flavor and texture over the centuries, and now one can find it in flavors such as honey, chestnut, and green tea. Head to the Dutch Slope (オランダ坂) on any day of the week to sample castella for free from one of the many vendors. Chawan mushi, a steamed egg custard, savory instead of sweet and filled with meat, fish, and mushrooms, is also famous. Another Nagasaki dish is Turkish Rice (トルコライス toruko raisu), named after the country. It consists of a pork cutlet, dry curry mixed into rice, and a small serving of spaghetti, all on the same plate. Tsuru-chan (ツル茶ん), Aburayamachi 2-47, tel. 095-824-2679, . Established in 1925, this is the original and perhaps still the best Turkish Rice joint (¥850 a serve) and one of Japan's first cafes. Open 9 AM to 10 PM every day. The worthwhile trip to the top of Glover Garden also yields another point of interest: the oldest Western-style restaurant in Japan, the Tenjin Coffeehouse. The stop in is worth it to see their impressive Dutch coffee-making equipment, when combined with the historicity could be why they charge about 550 yen for a cup. Being a large city, Nagasaki offers the full range of "alternative" sleeping arrangements. The cheap Planet Manga/Internet Cafe can be found two doors down from the Toyoko Inn on the main street south of the Nagasaki train station (about 3-4 min. walk from Nagasaki JR station). A 9 hour night pack will set you back 1780 yen, and a 12h hour 1980 yen (it should cost an additional 300 yen for the membership fee, but if they see you won't likely come back again they may, just may, waive the fee). They have quite comfortable private booths where you can sleep fine on a mat if you're less than 190cm tall. Be warned, though, that even if they have a non-smokers' section, partitions are not far away. As all manga cafés in Japan, there's a soft drink bar. Nagasaki International Hostel AKARI, Nagasaki-city, Kojiyamachi 2-2 (3 minutes walk from Kokaido-mae Station on tram), tel. 095-801-7900, . A comfortable hostel located in center of the city. Friendly staff are willing to help guests making travel plans. Free wireless internet in rooms and three computers in the lobby. Has a program called “Short walk with Nagasaki Locals”. Dormitory ¥2500, Ladies Dormitory ¥2800, private room ¥5900~. Casa Noda, NS bldg 6-1 Motofuna-machi, Nagasaki city, Nagasaki, 5min from Nagasaki Station, tel. +81 80 4270 1418 []. It is a very new and small hostel with only two dormitories, but they are creating more rooms now. If you come with more than four people you get a discount of 300 Yen. dorm room: 2300 Yen per person per night with breakfast. The owner is nice and gives very good tips about the local restaurants and temple area. Good English is spoken. Use the map on their website to find it. 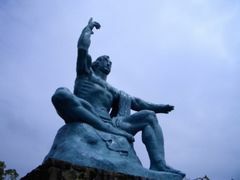 Nagasaki Kagamiya, 1-12-9 Hongouchi, Nagasaki city, (5 minutes walk from Hotarujaya station on tram), tel: +81 95 895 8250, . One of few Japanese style hostels in Nagasaki. It is a Japanese style house located in the Shrine which may make you feel calm. There is a room for KImono rental and you can experience or see Kimono if you want. About the location, please check their website. Free wireless internet in the room and computer for guests available. International Village Youth House, Sasebo City, Nagasaki (90-minute train ride on the Seaside Liner from Nagasaki Station). A very large hostel that looks a bit like an American college dorm complex with a gym, a cafeteria, and a couple of fields. Free wireless internet in the rooms and lobby. Lots of rooms, all private (1-4 people per room), from ¥2625 per person per night. It's not in Nagasaki city, but it's a good base for exploring the Nagasaki-Sasebo-Hus Ten Bosch area. Right next to Huis Ten Bosch. The typical array of business hotels can be found situated a short walk south of Nagasaki train station, along the main road between the station and the ferry terminal. Note that the Toyoko Inn Nagasaki does not offer the usual post-midnight check-in discount. Minato Sauna A sauna/sento (bathhouse) and capsule hotel located two blocks east of Nagasaki ferry terminal. Look for the jolly sailor logo on the and note that despite the clearly arrowed signage, the entrance is actually in the alley to the left. Sauna-only prices vary by time, but the full overnight stay costs 3675 yen. Although mid-range in capsule hotel pricing, the facilities are top-notch with completely smoke free sleeping quarters, sauna entry and re-entry included, free phone charging facilities and none of the common surprise towel, yukata or otherwise dodgy surcharges. An affordable restaurant and bar are on site as well as an attached coin laundry so one can even wash the very pants he is wearing. Men only. Nagasaki Biopark: This is a little ways outside of the city, but it is definitely worth an afternoon. This is perhaps the world's largest and best petting zoo, where one can feed and pet animals like capybara, flamingos, mara, and wallabies. From Nagasaki Station (長崎駅), hop on the Ogushi (大串) bus line, and ride north until you reach Kamedake (亀岳). Follow the signs with the cute animals, and Biopark will be on the right approximately 500 meters down the road. To return, look for the Nagasaki Terminal (長崎ターミナル) buses, which usually run hourly until 9. Huis Ten Bosch This is a Dutch-themed park located in nearby Sasebo, which one can access with the Kamome train line. For those who have already toured the Netherlands, there is probably not much of a draw, but if you are interested in the uncanny Japanese ability to faithfully reproduce the works of other countries (they even imported the bricks from the Netherlands), it is worth a visit. This page was last edited on 12 February 2018, at 15:34.